?What are the best ways to avoid running injuries? ?What is the difference between a sprain and a fracture? ?What is the recovery time for an Achilles tendon rupture? A broken foundation can create all sorts of trouble for a building of any kind, making it unstable and unable to continue supporting the same weight. Bone fractures, particularly in your own “foundation”—your feet and ankles—are just as bad for your stability and independence. Breaking a bone in your lower limbs can leave you hobbling, or even unable to walk at all. Without proper care, foot fractures can cause painful complications. The right treatment, though, can get you back on your feet. Bones in the foot, toes, and ankles break for a variety of reasons—you could have tripped, kicked something, landed a jump incorrectly, or even been in an accident. In some cases, it could even be an injury that developed and worsened over time, creating a stress fracture. Ultimately, though, your foot, toe, or ankle was subjected to more pressure than it could handle, so the bone tissue cracked and broke. Stress fracture – This is a thin crack in the bone tissue that doesn’t cut all the way through. It’s actually an overuse problem that tends to develop over time. Repetitive impacts and trouble absorbing pressure damages the bone tissue so it cracks, painfully weakening your foot and increasing your risk for a complete break. Nondisplaced fracture – A bone in your foot or ankle has broken completely, but the ends of those pieces are still lined up correctly. You may or may not be able to initially bear weight with that limb, but continuing to be active could make the damage worse. Displaced fracture – The ends of the broken pieces of bone are not lined up correctly. Instead, they are displaced from their normal positions. You might notice a bump or a protrusion where one of the broken ends is located. 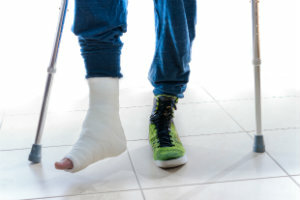 Broken toes – Like other fractures, toes can be displaced or not when you break them, but in most cases this injury is a little simpler than something like a broken ankle. Often these can be treated with a simple splint or buddy-taping. Bones can also break through the skin (open fractures), be broken in multiple places (comminuted fractures), or be crushed. The broken pieces have to be aligned correctly and held firmly in place for them to heal properly. Failing to take care of a broken bone correctly can lead to painful deformities and make it much more likely that bone will break again in the future. Getting foot fractures of any kind immediate treatment is important for your overall healing. Our experts at Absolute Foot Care Specialists will examine your lower limbs and use diagnostic images like X-rays to identify exactly where and how serious the damage to your bones actually is. From there, any displaced fractures will have to be realigned carefully. For most people this can be done conservatively, but serious fractures or bones that won’t stay in place might need surgery. Once the ends are aligned, your foot will be casted or placed in a special walking boot. You’ll need to limit how much weight you put on your foot, or avoid it completely. Bones take anywhere from several weeks to several months to initially repair a break—but even after that, you will need additional care, like physical therapy, to restore your lower limb to full strength. A foot fracture is a serious injury that definitely needs active intervention to prevent chronic pain or even deformities. The good news is that experts like Absolute Foot Care Specialists can easily help you take care of the problem. Don’t try to support yourself on a broken foundation. Get help today if you think you might have any kind of a fracture. Contact our Las Vegas offices online, or by calling (702) 839-2010.